I'm compiling a series of charts that show how Stephen Davis is related to a subset of his AncestryDNA matches. I find these charts helpful when trying to visualize the information provided by matches - and to see where the family may need additional tests. They're posted here in case they're useful to other researchers. Click on each chart to open it in a new browser tab. Click the image again to zoom in to a readable level, and scroll left or right as needed. Close the browser tab when finished. While these charts aren't completely consistent yet, in general a match at the bottom of the chart is shown in a lighter green if they are a DNA match to Stephen Davis. If they match to an Ancestry DNA Circle but not to Stephen, they're listed in a darker green. Because this is technically a "public" website, I've taken care to not include specific information about living people. For DNA matches, I've chosen to include the match's username if it didn't seem to provide the user's actual full name. When the full real name seems to be included in the username, I obscure a few letters for privacy protection. Please note that text within images such as these can't be indexed by Google or other search engines. The only way to see the information in these charts is for a real human to open the image and observe it. If anyone wants their username further obscured, please contact me using the link at the bottom of this page. The Davis, Whatley, Porch, Bonner, White and Grant families are ancestral lines of Steve's paternal grandfather, SC Davis. The Freeman, Johnston, Tingle, Watson and Ponder families are ancestral lines of Steve's paternal grandmother, Emma Cordelia White. We have a major brick wall in the Davis line. If anyone has discovered the identities of the parents of Allen R Davis (1821-1902), please let us know. The parents of his wife, Louisa F Shaddix (or Shadix - 1828-1907) are also unclear (although we are homing in on them). Stephen's yDNA-111 sample was mailed to FTDNA on 15 Dec 2017. I hope that will provide the clues needed to break through the Davis brick wall in early 2018. After clicking the image below, it will open in a new browser tab. Click on the new image to zoom in. There's no question that Steve descends from the Shaddix, Walden, Clayton and related lines. 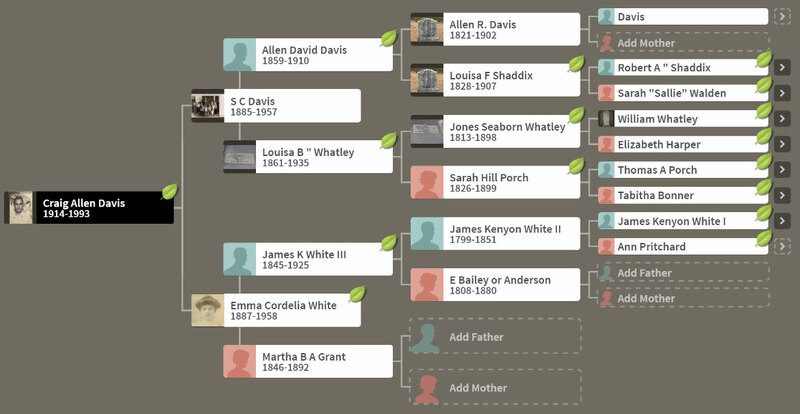 The exact connection between Steve's great-great-grandmother Louisa F Shaddix and these families is under investigation - but he has strong DNA matches to all of them. After clicking the image below, it will open in a new browser tab. Click on the new image to zoom in and then scroll to the left or right. The Freeman, Walker, Tingle and Castleberry families are ancestral lines of Steve's maternal grandfather, Nesbey Oben Freeman, Sr. 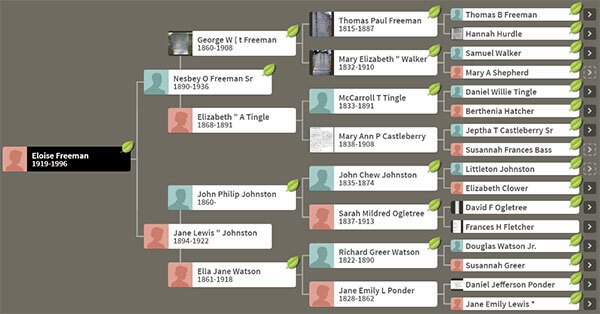 The Johnston, Ogletree, Watson and Ponder families are ancestral lines of Steve's maternal grandmother, Jane Lewis Johnston.